I’m thinking we were wrong about Syria, who used the gas and President Assad. Why was attack launched before full investigation? What did Assad have to gain? Why do local Christians support Assad? Too many questions. Bishop of Jerusalem told me USA was wrong and Russia right in regard to Syria. The bishops of Syria are coming out on the side of Assad. Big mistake 2 unseat Hussein, Mubarak, Gaddafi. Left void filled by radicals. Now Assad too? Arab Spring or Nightmare? Latter for Christians. I bet it will come out others did use Gas to set up Assad and provide reason to eliminate him. Sitting here in India one view is that the fact that Obama did not do anything when Syria crossed his red line seems to have played no small part in promoting Donald Trump to act decisively. Driver being ego, knee jerk , rash or sound judgment – time will tell . What is intriguing is that very little time or effort seems to have gone to publicize the conclusive proof that these sarin gas attacks were indeed the result of Syrian government bombs rather than any other scenario. This sarin gas attack allegedly by Syrian government seems unusual and out of character , for a party that had regained the initiative and regained large swathes of territory from the rebels. Why risk universal isolation and exactly the kind of intervention now enacted by the USA when you are winning and the people you rule over are relatively happy. Having lost the initiative with the surrender of Aleppo thanks to the intervention of Russia , the Western coalition needed an excuse to intervene to try and get a seat at the table to ultimately resolve this Syrian issue. The UN standing as an impotent spectator yet again. Only God can help us all avoid another post western intervention Iraq and Libya state of disorder and the continued existence of ISIS. 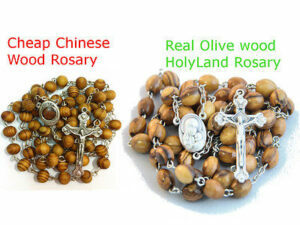 Are You Buying REAL Holy Land Olive Wood Products? or Chinese Cheap Imports? 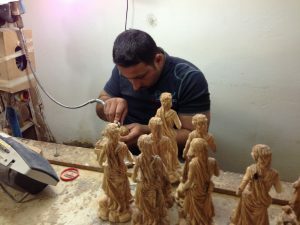 Soon we will take another group to Bethlehem to buy quality Olive Wood products make and sold by the local Christians. 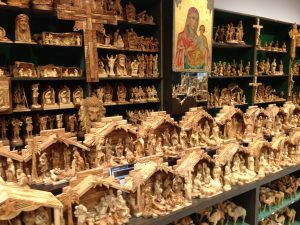 When we bring our groups here we only take them to shops that sell the REAL DEAL, real Olive Wood products carved by the local Christians who are in much need of our help. In this way, you are insured of getting the best quality product AND certain you are helping the local Christians. Lots of the things for sale in the Holy Land are cheap knock-offs. What a shame to get junk and fail to support the local Christians. This also goes for products that are sold in parishes in the USA. Make sure the people selling in the parishes are REALLY Catholics and have the REAL products. There are many scams even in the US. BETHLEHEM, West Bank (AP) — Christmas is approaching and pilgrims and tourists have begun to arrive, crowding the souvenir shops that line the narrow streets and alleys of Bethlehem, the biblical town revered as Jesus’ birthplace. But when visitors choose to take a piece of the Holy Land back home with them, they better check the labels. Many souvenirs — including the West Bank town’s trademark rosary beads — are imported from abroad, mainly China. A small number of souvenir shops are now trying to fight the trend, stocking their shelves almost exclusively with locally made products. Shopkeepers say that while their wares may be more expensive, the quality is much better and they give an important boost to the struggling economy. A great way to celebrate Lent and to enhance your prayers. Check it out and buy it HERE. It is available in both CD disk or MP3 download (MP3 available very soon). 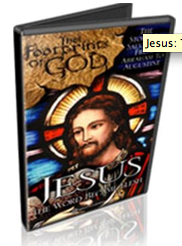 Learn the origins and history of the Stations, what led up to Christ’s Condemnation to Death. 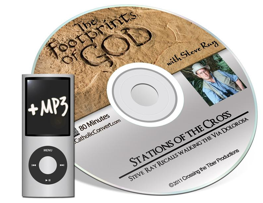 Steve then goes through each Station based on his knowledge of the Bible and Jerusalem and the “real” Stations. Biblical, medical, geographical and spiritual meditations on each Station. Listen to an audio clip before purchasing. Companion Talk: The Pain of the Crucifixion. See it here. Also recommended for family movie night. Get popcorn, settle in and enjoy as a family this fun-filled, profound life of Christ all filmed on location with Steve Ray.